The Australian Shepherd, often known simply as the "Aussie", is a medium-sized breed of dog that was, despite its name, developed on ranches in the Western United States, during the 19th century. There are different theories regarding the association of the breed with Australia, but there is no consensus on why it was adopted. Genetic research has found that Australian Shepherds and Border Collies are closely related to each other; both are slightly more distantly related to other kinds of Collies and to Shetland Sheepdogs. Aussies rose in popularity with a boom in Western riding, after World War II. They became known to the general public through rodeos, horse shows, and Disney movies made for television. For many years, Aussies have been valued by stockmen for their versatility and trainability. They have a similar look to the popular English Shepherd and Border Collie breeds. While they continue to work as stock dogs and compete in herding trials, the breed has earned recognition in other roles due to their trainability and eagerness to please and are highly regarded for their skills in obedience. Like all working breeds, the Aussie has considerable energy and drive and usually needs a job to do. It often excels at dog sports such as dog agility, and frisbee. They are also highly successful search and rescue dogs, disaster dogs, detection dogs, guide dogs, service dogs, and therapy dogs. They are considered the 17th-most popular dog breed in the United States. The Australian Shepherd is a medium-sized breed of solid build. They can weigh from 30 to 65 pounds (14 to 29 kg) and stand from 17 to 26 inches (43 to 66 cm) in height. The ASCA standard calls for the Australian shepherd to stand between 18 and 23 inches (46 and 58 cm) at the withers, females being 18 to 21 inches (46 to 53 cm) and males measuring 20 to 23 inches (51 to 58 cm); however, quality is not to be sacrificed in favor of size. 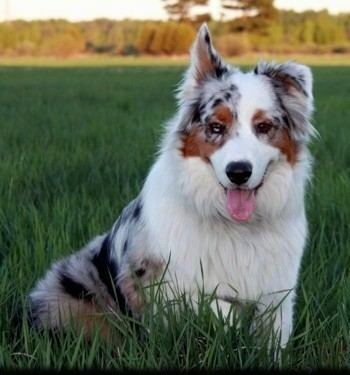 Aussie colors are black, red (sometimes called 'liver'), blue merle (marbled black, white, and gray), and red merle (marbled red, white, and buff); each of these colors may also have copper (tan) points or white markings in various combinations on the face, chest, and legs. A black or red dog with copper and white trim is called 'tricolor' or 'tri', a black or red dog with white trim but no copper is called 'bicolor' or 'bi'. White, rather than pigment, on or around the ears is an indicator of increased risk for white-related deafness. Excessive white on the face and ears can place an individual dog at greater risk for sunburn and subsequent skin cancer. Black, with tan points, white markings, or both on the face, collar, legs, chest, underbelly - solid black dogs are equally desirable as ones with tan or white. Red (liver) with or without tan points or white markings on the face, collar, legs, chest, underbelly - either white or tan points are required. Solid red dogs are equally desirable as ones with tan or white. Blue merle (a mottled patchwork of gray and black) with or without tan points or white markings on the face, collar, legs, chest, underbelly - neither white nor tan points are required. Solid merle dogs are equally desirable as ones with tan or white. Red merle (a mottled patchwork of cream and liver red) with or without tan points or white markings on the face, collar, legs, chest, underbelly - neither white nor tan points are required. Solid merle dogs are equally desirable as ones with tan or white. The merle allele, which produces a mingled or patchwork combination of dark and light areas, is the coat pattern most commonly associated with the breed. This merle (M) is dominant, so heterozygous dogs (Mm) show the pigmentation pattern; however, when two merles are bred, the statistical risk is 25% of the offspring will end up with the two copies of the merle gene (homozygous). These dogs usually have a mostly white coat and blue irises, and are often deaf, blind, or both. In this case, the deafness and blindness are linked to having two copies of the merle gene, which disrupts pigmentation and produces these health defects. All black and blue merle dogs have black noses, eye rims, and lips. All red and red merle dogs have liver or brown noses, eye rims, and lips. Also, great variety is seen in the Aussie's eye color, and they are often heterochromatic. An early nickname for the breed was "ghost-eye dog". Aussie eyes may be any shade of brown, or blue; they may have two differently colored eyes, or even have bicolored or "split eyes" (for example, a half-brown, half-blue eye), which appear to be linked to the merle coloration. Merled eyes occur, as well, where one color is mixed in and swirled with another. Any combination of eye color is acceptable in the breed standard, so long as the eyes are healthy. In general, however, black Aussies (self, bi-color, or tri-color) tend to have brown eyes, while red (self, bi-color, or tri-color) Aussies tend to have amber eyes, though these Aussies may also carry the blue-eyed gene. These dogs are also brown in color. Some Aussies are born with naturally bobbed tails. Others have full long tails, and others with natural partial bobs, where the tail is shorter and appears stubby. Breeders have historically docked the tails when the puppies are born. In the United States and Canada, the standard calls for a natural bob or docked tail not to exceed four inches as a defining characteristic; however, some long-tailed examples have been successfully shown and been given recognition. Any natural tail length is permitted when showing in Europe, where docking has been banned in most countries, including the United Kingdom. 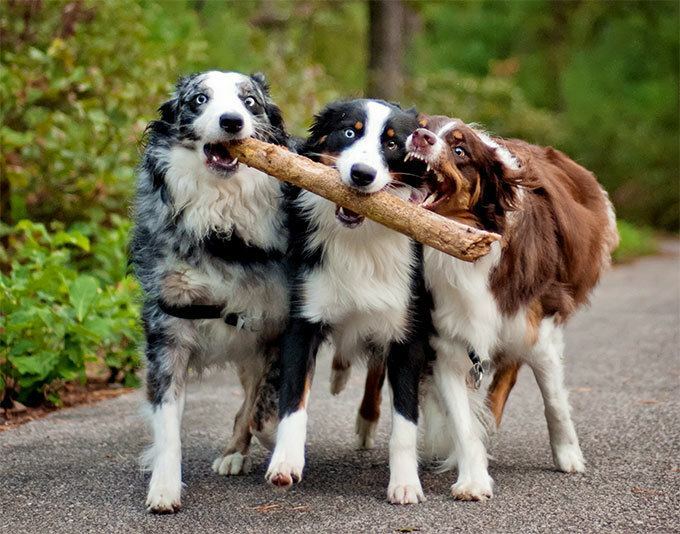 The Australian Shepherd has a reputation as a highly intelligent and versatile stock dog with a range of working styles. A good working Aussie is quick, thoughtful, and easy with its stock. The ability for the breed to adapt to the situation and to think for itself makes it an excellent all-around worker. For this reason, the Aussie is often chosen to work unusual livestock such as ducks, geese, and commercially raised rabbits. These dogs require a minimum of two to three hours a day of play, exercise, and attention. They thrive in rural, ranch-like conditions, and need space to run and play in an urban setting. The Australian Shepherd is a high-spirited dog, that requires much attention and work. Teaching them tricks keeps them focused and happy, which also keeps their minds working. The breed also has great stamina and can live in a variety of terrain. Because of this, they are popularly used as trail and working dogs. Australian Shepherd can have several health problems. Vision problems are common, and epilepsy is also a concern. In merle-to-merle breeding, the puppies that have inherited two copies of the merle gene have an increased risk of being born blind and/or deaf. The recommended amount of food an Australian Shepherd should eat is 1-1/2 to 2 cups of dry food a day, But size, exercise level, and age should be considered. With proper diet and exercise, the Australian Shepherd can stay in good shape. Australian Shepherds have a medium-length, water-resistant coat. With the coat being somewhat long and wavy or curly, this breed does shed, mostly in the spring to get rid of the winter coat. The shepherd should be brushed weekly to maintain a healthy and clean coat and also to prevent matting. With being a "working dog", this breed should be outside to get its needed exercise. If a dog is dirty, a basic bath can be given, but not frequently, for it can dry out the skin and coat. Australian Shepherds have surprisingly long lifespans for their size, living significantly longer than most dogs of a similar weight. Results of a 1998 internet survey with a sample size of 614 Australian Shepherds indicated a median longevity around 12.5 years, but that longevity may be declining. A 2004 UK survey found a much shorter median longevity of 9 years, but their sample size was low (22 deceased dogs). The median lifespans for breeds similar in size to Australian Shepherds are mostly between 11 and 13 years, so, assuming the results of the UK study are not representative of the population there, Aussies appear to have a typical lifespan for a breed their size. Leading causes of death in the UK survey were cancer (32%), "combinations" (18%), and old age (14%). Based on a sample of 48 still-living dogs, the most common health concerns noted by owners were eye problems (red eye, epiphora, conjunctivitis, and cataracts). Dermatological and respiratory problems also ranked high. Collie eye anomaly (CEA) is rare in the breed, but it and cataracts are a concern in Aussies. Other conditions of note include iris coloboma, canine hip dysplasia, Pelger-Huet anomaly, hypothyroidism, and nasal solar dermatitis. Prior to breeding, the Aussie should be checked for hip and elbow dysplasia and DNA tests performed to show the dog to be free of the MDR1 mutation, cataract mutation, and CEA. Tests should also include those for thyroidism and clearances for other known eye diseases like colobomas, progressive retinal atrophy, and retinal folds. Some Australian Shepherds (as well as Collies, German Shepherds, and many other herding dogs) are susceptible to a genetic mutation of the MDR1 gene. Dogs with the mutation can suffer toxicity from antiparasitics such as ivermectin in high doses, and other drugs. A test is available to determine if a particular dog carries the mutated gene. Hip dysplasia is a heritable condition where the femur does not fit securely in the pelvic socket of the hip joint. This problem can exist with or without clinical signs, meaning some dogs feel pain in one or both rear legs. Double merle or homozygous merle occurs when the offspring of two merled parents inherit two copies of the dominant merle gene. The odds of this are 25% for each pup born from such a litter. Double merles often have excessive white and can have hearing and vision problems as a result of having two copies of the merle gene. Homozygous merles can be deaf or blind, or express iris colobomas and microphthalmia. Not all homozygous merles are affected, but most are, making the breeding of two merles a very touchy subject. Some breeders euthanize mostly white pups, while others may attempt to sell them as "rare" white Aussies without disclosing the potential for health defects. A large percentage of homozygous merles sold eventually end up in rescue and shelters, as the average family is ill-prepared to take on a deaf or blind pet. However, deaf or blind Australian shepherds can make wonderful pets given a home prepared for their special needs. They are an intelligent breed, which generally learn hand signals with ease. The term "lethal white" originated from horses born with lethal white syndrome, and has since evolved to often describe dogs born with the double merle trait. 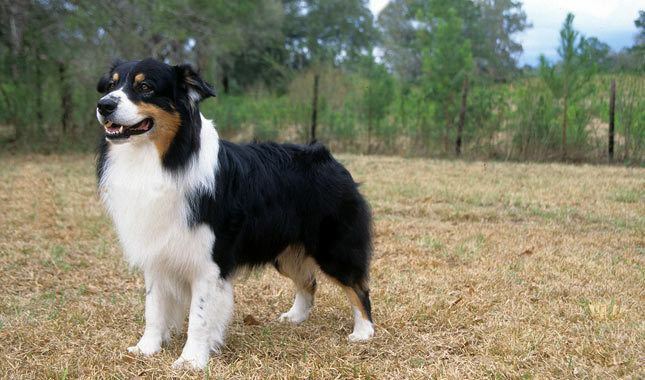 This trait is found in many breeds, but most commonly found in Australian Shepherds. The name "lethal white" is a misnomer, as this genetic condition is not lethal to the dogs; it is often the breeder who is lethal to the pups by culling them immediately after birth. Many consider the term "lethal white" to be derogatory. Many diagnostic tests are available for concerned Aussie owners to check the overall health of a dog. Also, the Orthopedic Foundation for Animals (OFA) has an extensive database to track results and provide statistics for these concerns: hips, elbows, heart, patellar luxation (knees), and thyroid (autoimmune) disease. The OFA database also includes the results for eye exams performed by a Canine Eye Registration Foundation veterinarian, but only if the owner of the Aussie submits the results. This database is a great resource to investigate the lineage and related health of the progenitors of some dogs, at least regarding hip ratings. 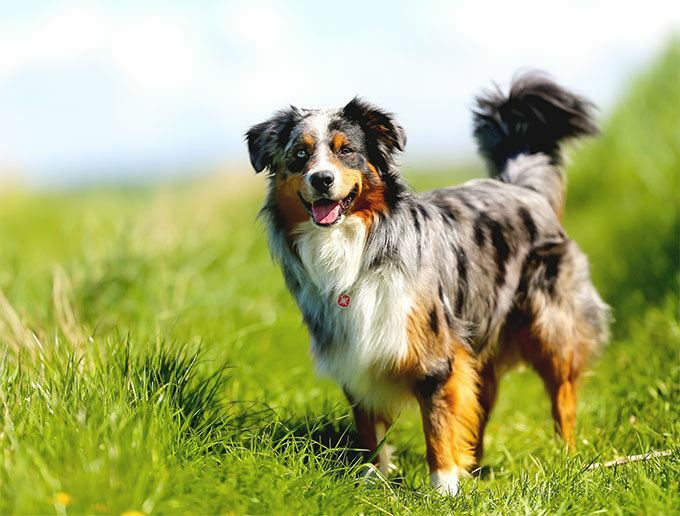 Many tests have been developed by, or are processed at, laboratories to check for the 11 health concerns that plague the Australian Shepherd breed. Some of those labs are Optigen, Animal Health Trust, Endocrine Diagnostic Center, Animal Health Laboratory, Washington State University Veterinary Clinic, Vet DNA Center, and HealthGene. These labs might perform one or many of the tests that have been developed. DNA testing to either certify parentage or to verify parentage) for Australian Shepherds can be performed, and as of January 2010, all adults producing a litter will be required to be DNA tested to allow a breeder to register a litter with the Australian Shepherd Club of America (ASCA). The Australian Shepherd's history is vague, as is the reason for its misleading name. The breed was initially called by many names, including Spanish Shepherd, Pastor Dog, Bob-Tail, New Mexican Shepherd, California Shepherd, and Austrian Shepherd. It is believed by some that the breed has Basque origins in Spain and was used there by shepherds. Those shepherds might then have emigrated to the West Coast of the United States via Australia. However, scientific evidence has shown that the breed has lineage from American dogs that originally came over the Bering Land Bridge. What is known is that it developed in western North America in the 19th and early 20th centuries. The Australian Shepherd was a particularly tireless sheep herder in the Rocky Mountains because it is relatively unaffected by altitude. Ranchers in Boulder, Colorado, began breeding the dogs which would attract purchasers from as far west as California for their legendary sheep-herding abilities. A theory suggests that they were named for the imported sheep that they herded. 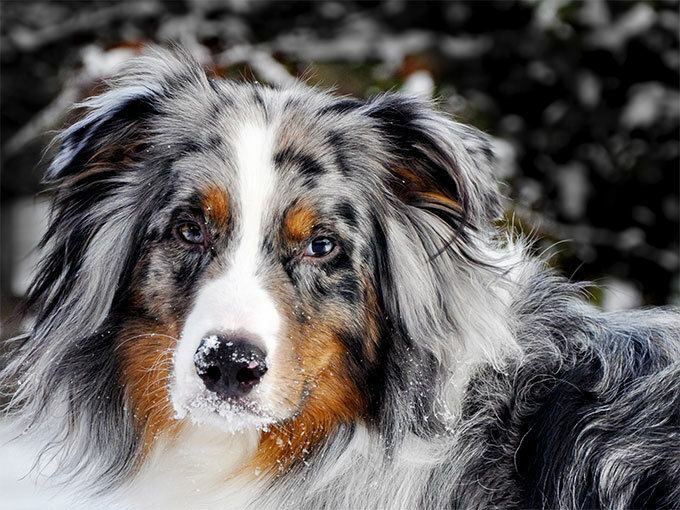 It is also possible that many of the dogs coming from Australia were blue merle and the adjective "Australian" became associated with any dogs of that coat color. Breeds as we know them today did not exist before Victorian times, but local variations of the ancestors of current breeds came into America along with their owners and livestock. Included are some that are now extinct or that have merged into other breeds. These may have included some British herding dogs, native dogs from North America (originating in Asia/Siberia), as well as dogs from Germany and Spain including the Carea Leonés. For many centuries, shepherds were more interested in dogs' working abilities than their appearance. As a result, over time, shepherds interbred dogs that they believed would produce better workers for the given climate and landscape. In the eastern U.S., terrain and weather conditions were similar to that of Europe, so the existing imported breeds and their offspring worked well there. In the American West, conditions were quite different. Spanish flocks were introduced for food and fiber which was mainly the Churra. The Spanish dogs that accompanied them to American West proved well-suited for their job in the wild and dangerous territory. They were highly valued for their ability to herd and protect their charges from predators on the open range. In the arid and semiarid areas inhabited by early Spanish settlers, temperatures reached extremes of hot and cold and fields varied in altitude from sea level to the higher, rougher Sierra Nevada and similar mountain ranges. The ranchers in these areas often pastured livestock on remote ranges. They preferred more aggressive herding dogs that served in the capacity of herder and guardian. Development of the breed began in the American West. The breed's foundation bloodlines are depicted in the Australian Shepherd Genealogy Chart showing the relationship between the early families of dogs. The American Kennel Club ranked the Australian Shepherd as the 17th-most popular breed in the United States in 2016. Selective breeding for many generations focused on aspects of the dog that enabled it to function as an effective stockdog in the American West. It had to handle severe weather; have plenty of speed, athleticism, energy, and endurance; and be intelligent, flexible, and independent; while remaining obedient. The actual foundation for the Australian Shepherd was established between the 1940s and the early 1970s, when the Australian Shepherd Club of America was formed and the registry was started. Their stunts and skills earned them places in several Disney films, including Run Appaloosa Run and Stub: The Greatest Cowdog in the West. 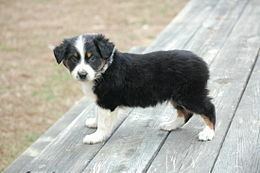 An Australian shepherd was featured in the film Flight of the Navigator (1986) and the TV series Flash Forward (1996). More recently, an Australian Shepherd starred in the film Famous Five (2012) and its sequels. Like other herding breeds, these dogs excel at many dog sports, especially herding, dog agility, frisbee, and flyball. Herding instincts and trainability can be measured at noncompetitive instinct tests. Aussies that exhibit basic herding instincts can be trained to compete in ASCA stock dog trials or AKC herding events. The dog has a stride in which its front and back legs cross over, making for an appearance of "on the edge" speed. The dogs instinctively use a "pounce" position to deal with cattle trying to kick them. They also have strong hips and legs, allowing for fast acceleration and high jumping, sometimes as high as 4 ft (1.3 m). An Australian shepherd named Pockets is credited as being the oldest dog to earn a title in AKC history, having earned the Rally Novice title at the age of 15 years, 5 weeks. The Australian Shepherd Club of America (ASCA) was founded in 1957 to promote the breed. The National Stock Dog Registry became its official breed registry, which continued until ASCA took over in 1972. In 1975, ASCA created a breed standard, describing exactly how an Australian shepherd should look and be constructed (its conformation to the Standard). It developed more uniformity in the breed and standardized the type. In the United States, the American Kennel Club (AKC) is the primary registry for purebred dogs, and first recognized the Australian Shepherd in 1991 as a member of the Herding group. However, many Aussie breeders felt the AKC put too much emphasis on breed conformity and not enough on performance, so the ASCA declined to join the AKC. Those breeders who felt that AKC membership had its advantages split off from ASCA to form their own Australian Shepherd club, the United States Australian Shepherd Association, created their own breed standard, and joined the AKC in 1993. The decision about affiliation with the AKC remains controversial, as it does with many performance breeds. The Fédération Cynologique Internationale recognized the Australian Shepherd for international competition in 2007, in Group 1 Sheepdogs and Cattle Dogs as breed number 342. The Miniature Australian Shepherd was developed by breeders looking for smaller dogs ranging in size from 14 inches to the Aussie standard. In 2010, NAMASCUSA renamed the breed Miniature American Shepherds and subsequently changed their name to MASCUSA, The Miniature American Shepherd Club of the USA. This new breed gained acceptance into the AKC Miscellaneous class in June 2012 with the sizes written in the standard as females from 13–17 inches and males from 14–18 inches. In addition, an emergence of an even smaller version occurred, referred to as the Toy Australian Shepherd, with adult males weighing 12–15 pounds (5.5–7 kg) and all dogs falling under a 14-inch height at the withers. Many breeders and owners of Australian Shepherds consider the Mini and Toy to be separate breeds; others consider them to be down-sized versions of the same breed. While the Mini size can be attained through selective breeding of small Australian Shepherds, the Toy size is typically a result of cross breeding with other toy breeds. ASCA and AKC consider both variants to be separate breeds.